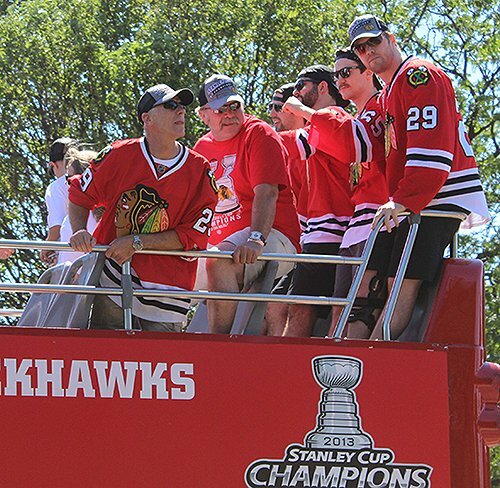 Bryan Bickell (29) and his teammates on the way to Grant Park. As calls of dehydrated fans and other heat-related issues had police scanners buzzing during the parade and rally, Salvation Army volunteers were stationed outside of Grant Park handing out 100,000 bottles of water. Chicago Police also tossed bottles of water to fans while they waited for the rally to start. Bottles of Dasani were stacked on tables and tossed to passersby as workers called, “Free water,” to skeptical Blackhawks fans. While the Salvation Army asked for nothing in return, one person took advantage of their good will, taking numerous and selling them to those entering the park. “You can’t really steal something that’s free,” said one volunteer. “I told [a volunteer] I stopped him from doing it, he says he just works for the company, he’s just doing what they told him to do,” said Raymond Hall, who was working security. He added that the only thing he could do was point out the man to police. As predicted, the rain showers forecast for Friday held off until late afternoon and early evening. Temperatures were in the 70s in the shade but were much warmer than at Grant Park, as Hutchinson Field doesn't have any shade. According to USA Today, Chicago Fire Department spokesman Larry Langford said 42 people were taken to hospitals with heat-related health problems. Twenty people jumped into the restricted area of Lake Michigan, according to Langford, and the fire department saw to it that all 20 came out of the water safely. What does the Blackhawks' fifth Stanley Cup and second in four years mean from a historical perspective? 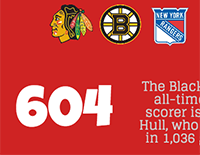 Find the answers in the Blackhawks by the numbers interactive infographic. Police did not announce a number of arrests at the rally, but early indications that were there were few.